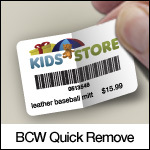 The BCW Quick Remove is a smooth, bright white, highly sensitive, direct thermal, paper labelstock that produces high quality images. The general purpose, removable adhesive, exhibiting good cold and room temperature performance, is ideal for smooth, flat surfaces. A special topcoating protects the thermal layer, thereby maximizing printhead life. BCW Quick Remove is resistant to water, blood, oil, alcohol and fats. No ribbon required. 1.20" x 0.85" direct thermal, removable paper label on a 1" x 4" core. 1500 labels per roll / 8 rolls per case. BCW Quick Remove 1141275 special features - Perforated. No ribbon required. 2.25" x 1.25" direct thermal, removable paper label on a 1" x 4" core. 1250 labels per roll / 8 rolls per case. BCW Quick Remove 1143125 special features - Perforated. No ribbon required.